Socialists around the world never hold up Venezuela (or North Korea, or the Soviet Union, or Albania, or Cuba) as an example of a successful socialist economy. That honor nearly always goes to Sweden; never mind that Sweden isn’t actually socialist. But it is a welfare state, and that’s the best the Left can do. But the idea that Sweden proves welfare state policies are a path to prosperity is false. 1. Sweden became rich when government was small. Indeed, until about 1960, the burden of the public sector in Sweden was smaller than it was in the United States. And as late as 1970, Sweden still had less redistribution spending that America had in 1980. 2. Sweden compensates for bad fiscal policy by having a very pro-market approach to other areas, such as trade policy, regulatory policy, monetary policy, and rule of law and property rights. Indeed, it has more economic freedom than the United States when looking an non-fiscal policies. The same is true for Denmark. 3. Sweden has suffered from slower growth ever since the welfare state led to large increases in the burden of government spending. This has resulted in Sweden losing ground relative to other nations and dropping in the rankings of per-capita GDP. 4. Sweden is trying to undo the damage of big government with pro-market reforms. Starting in the 1990s, there have been tax-rate reductions, periods of spending restraint, adoption of personal retirement accounts, and implementation of nationwide school choice. 5. Sweden doesn’t look quite so good when you learn that Americans of Swedish descent produce 39 percent more economic output, on a per-capita basis, than the Swedes that stayed in Sweden. Powerful stuff. 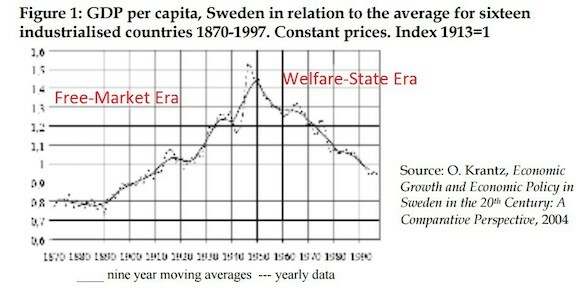 Mitchell adds this chart, which comes from Professor Professor Olle Krantz, and tracks Sweden’s per capita GDP is a ratio to the average of 16 industrialized countries, from 1870-1997. My state, Minnesota, is a lot like Sweden in this respect: liberals don’t pretend that states like Illinois and Connecticut are evidence of the success of blue-state policies, but they like to offer Minnesota as proof that liberal policies can work. Unfortunately, that isn’t true.